The truly dedicated had been in Dublin city centre since before 6am, when the first few shops opened their doors, most notably Next. The retailer’s red carrier bags were the most conspicuous on the streets in the earlier hours, and its shelves were, if not decimated, certainly significantly depleted by 8.30am. Most retailers, however, went for a more civilised 9am start. Those waiting for the doors to open were shoppers with definite strategies. “I planned it out a number of days ago, I know what I want and where it is. The only mistake I made is that I’m in since 7am because I thought more places would be open,” said Rachel Berthiani from north Dublin. 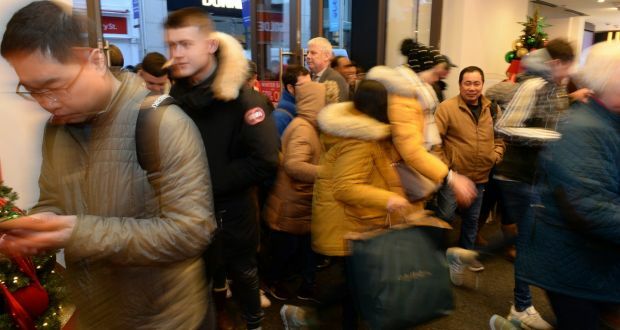 “I know the bag I want, but I don’t know if they still have it, because I saw it, but went off to think about it, but now I have to wait to get back into the area,” said one Co Meath shopper in the Prada queue, who did not want to be named. The bag, if she’s successful in scoring it, would cost around the €500 mark after a 40 per cent discount, she said. The company’s shops in Cork, Limerick and Galway saw a more traditional shopper profile, with accessories and women’s clothing the main draws he said. Footfall appeared to be strong across the regional cities, said Thomas Burke, director of Retail Ireland.